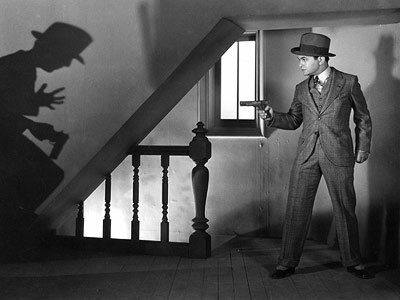 Directed by Marvin LeRoy for Warner Bros., Little Caesar (1930) is the first great crime film in cinematic history. The film launched a series of mob-crime films in the 1930s, all mimicking its sleazy, low-budget sets that reflected the criminal underworld of the 1920s and 1930s. The film’s title character and story-line all mirror the life and times of Al Capone. 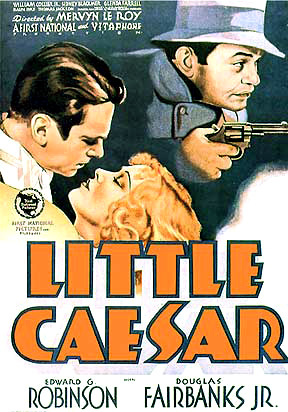 Little Caesar stars Edward G. Robinson as Little Caesar and Douglas Fairbanks as Joe Massara. The big city mob world has been dominated by Diamond Pete Montana. Caesar Enrico Bandello, or “Rico”, complains that he wants the chance to ‘be somebody’, like a fugitive or an outlaw who commands respect and authority. He and his friend Joe join the Sam Vettori gang, and their first job is to rob the night club where Joe works. Despite strict orders, Rico guns down commissioner Alvin McClure during the heist. Upon returning, Rico seizes control of Sam’s gang and after nearly getting shot by ‘the Big Bosses’ henchmen, he edges out other rival mob bosses and gains control of the city’s entire north side. Little Caesar vaulted Robinson into Hollywood stardom, and brought crime films into the mainstream. It is a classic that should be in every film lover’s repertoire.